Why should a business create custom software? 1. A business broker can allow the maximum exposure of key selling points for a business to the largest network of buyers, yet maintain confidential information that is available only to those with an executed NDA. 2. A manufacturing company can customize a QA system to collect exactly the information that is needed and summarizing results to a live production monitoring dashboard. 3. A consulting firm may create a software package that enables their clients to implement the recommended business practices thus increasing compliance to best practices and leveraging the consulting results with a simple-to-use system. 4. A professional organization will eliminate repetitive steps of extracting, sorting and calculating values with a spreadsheet. A custom system can eliminate manual work and provide enhanced reporting and notifications. Marketing, finance and engineering professionals often have standard reports they build for managers that can be automated to save many hours each week. The justification usually requires the absence of a commercial solution that fits the requirements – missing functionality, limited work flow customization, high costs or inability to redistribute as needed. If there is justification, then there are a few ways to increase the speed to solution, manage costs and reduce the risk of delayed or inadequate solution. Many businesses that use custom software have limited experience or capabilities with the technical aspects of writing code. 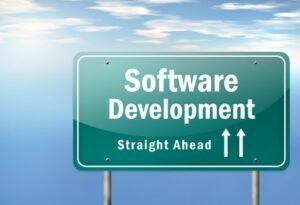 When selecting a developer or firm to create custom software it is important to find a good fit. This requires the ability to communicate well, comprehend your business processes, have technical skills to build a solution and business experience to know what options are available as existing solutions. Next week – Finding a fit with a software development partner.